It may seem obvious that when you learn to play guitar you also need to learn the notes on the fretboard. How can you play music without knowing the note names? Well believe it or not, there are a lot of guitar players out there who don’t have the slightest clue what they are playing and they do just fine. I didn’t know all the notes on the fretboard for a long time either. And yes I could still play all my favorite tunes and improvise over chord progressions. But there were limitations that I wasn’t aware of at the time. Huge limitations! Once I started learning the notes on the strings and figuring out what the notes of chords, scales and licks were, things started to change. One discovery let to another and a lot of things suddenly made sense and became clearer. My knowledge expanded and my playing improved. I learned all this in small steps. You don’t have to start learning every chord and scale note right away. Do it in small baby steps. First start learning the notes on the fretboard and take your time with it. This will already change everything as you will learn to recognize the notes you play. Once you’ve mastered this, you can learn chord and scale notes and analyze some of the things you play. Play the notes of a particular chord one by one, speak the note names out loud and try to memorize them. The next time you do that with the notes of a scale. You will probably forget the notes after a while, then relearn it until it’s stored in your long term memory. It will come in time and it will work for you in many different ways. Let’s be fair here. Knowing the notes and understanding the fretboard is not an overnight thing. It takes time and effort, but it will going to serve your playing every step of the way. Over the months and years it will benefit you in every aspect, no matter what style you are playing. It will all come to you! Below you will see how. Knowing the notes on the strings makes it possible for you understand chord construction, identify chords, how they are build and how you can easily add chord embellishments like sus2, sus4, maj7, add9, etc. Once you know the most common barre chords and you have also learned the notes on the 6th Low E-string and the 5th (A) string then you can move any chord up and down the neck and play them in every key. When you know the notes on other strings as well you are free to move up and down any closed chord shape, recognize their root note, play them in different keys and know their chord names instantly. Knowing the notes makes it real easy to transpose a song to a different key that suits your voice or to simplify the chords for the song. Being able to recognize the notes of a scale will eventually make you understand why a scale works like it does and how it relates to chords and soloing. You will comprehend the bigger picture of every musical aspect of the guitar. Identifying notes instantly on the fretboard anywhere makes you able to play around with your solo ideas, understanding your melodies, the scales you apply, how to duplicate soloing ideas to other areas on the neck. You will understand more and more what you are doing, why it sounds they way it does and how to expand your possibilities. Communicating with other musicians in a band is a really important thing. Poor communication leads to frustration and time consuming matters. When you know your instrument you can talk to each other in musical language and keep things short, clear and then move on doing what you ought to be doing and that is making music. I’ve already created a post on how to learn the fingerboard thoroughly in 16 days. If you want to be serious about your guitar playing, check it out! 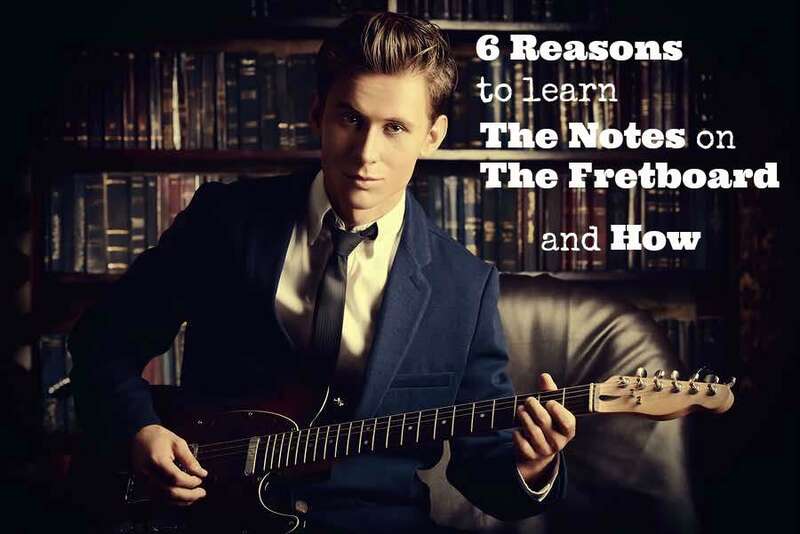 Do you know more reasons to learn the notes on the fretboard? Please share in the comments. Thanks! Exclusive Email Updates and Product Offers. Hi Klaus, Is a g major chord an open chord? What would be a closed chord? Chords with open strings are open chords. Chords with NO open strings (like barre chords) are closed chords. your website is amazing and really helpful. you are doing a great job. you are really inspirational too. after reading some of your blogs i think you might help me with my situation as i am finding no one to tell or make them comprehend. i live in india. i am 24. i have a govt job. i am learning guitar since 2 years. guitar is my dream. i always think that i should have started earlier but due to my studies and career i couldnt. but now my parents are forcing me to go for a more higher quality job. but i know, then i wont have time for guitar and would have to move out of my home town. now i have a decent job, i get time for guitar but due to this forcing of parents a lot of things go through my mind like can i ever become good at guitar? will in future i regret not opting for better job? etc etc. i cant explain to my parents that the job i am doing is enough for me and its best as i get ample time to plan for guitar. i am confused. you may well understand my situation. please help sir. will be eagerly waiting for your response. It depends. How are your circumstances? How are your financies? Do you make enough money to support yourself? Will you make enough money to support your (future) spouse and kids? Your parents probably didn’t have the job opportunities you have now and they want the very best for you. But this is your life and your happiness. Thnx for replying.. As I want my mind to settle down I want to explain to you my situation.. Our family is financially stable.. And as you asked, yes I will be able to support my family financially in future as the job I am doing is for the government and it has full job security.. My parents know that too.. They just want that I aim for the top position. And yes u were absolutely right that my parents want the best for me.. And Sir honestly, I am not blaming theit’s or this.. But those jobs demand high responsibility towards work which means whole of my time will be eaten up at work, there will be no space for guitar.. I will have more money may be, but will I be satisfied? its just this, that I didn’t join for guitar in my school because studies was Top priority, didn’t join after my school because I had to work hard with my career at college. And now that I have a job, is it wrong or too late to dream about being a guitarist? Klaus I don’t know what level I would reach at guitar but now I feel like I have an aim of being an accomplished guitarist and I will fight hard for it.. Sir am I doing wrong? That paragraph hit me hard! I discovered your website last week, and have been slowly learning all the notes. I have been playing for 10 years and have never known a single note, just played scales and chords I was taught years ago. I never ventured outside my box. Now, I finally have and I was telling my significant other the other day that it feels as if a switch in my brain finally clicked! I know now what I’m actually doing..
It’s frustrating to practise scales and chords without learning notes on fretboard, with fretboard memorisation a lot of time is saved and one can become creativity with a guitar very quickly and effectively.